There really is a Simulator for everything. Coming to PS4 later this year, Bee Simulator allows you to play as a hard-working honey bee in your quest to maintain your hive. A single player story mode has you pollinating flowers, communicating with your fellow insects, and partaking in all other aspects of bee life. "See the world through the eyes of a bee! Compete with other bees in races, collect pollen, perform waggle dances, and explore a world inspired by Central Park in New York," the official blurb reads. "Play it with your family or friends, choosing between three modes, including co-op and vs. split-screen." Developer Varsav Games Studio has just struck a deal with Bigben Interactive, which will be taking on publishing duties for the game. "It's a real pleasure for us to work with Varsav Game Studio on this game," says Bigben's head of publishing, Benoît Clerc. "We were immediately impressed with the passion shown by this studio, which has been working for several years on this innovative game with mainstream appeal." We're not totally sure about mainstream appeal, but this odd title does look like it'll offer up some silly fun. What do you think of Bee Simulator? Will you bee giving it a try on PS4? Generate a buzz in the comments below. Hopefully the price point doesn't sting! About bloody time there's a decent bee sim on PS4! Hmmm, memories of Mr Mosquito on PS2! Seriously though, this looks awful but, seeing as Bee's are suffering a bit of a crisis at the moment, it's probably been made to try and get kids to recognise how important they are. Which is worthwhile and noble in my book. Actually, this game seems surprisingly intriguing. 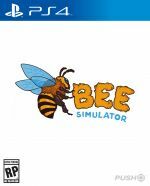 I think most simulator games sound like such a slog, but to experience life as a bee, well that sounds great. Until you get swatted, that is. I've heard it runs like honey. In the words of Nicolas Cage: "NOT THE BEES!!!" I'll probably wait until it's part of a Bumble Bundle. "...Working for several years on this innovative game with mainstream appeal." So i get to play as the the Romper Room Do Bee? Sold ! Everyone's Buck Bumble fantasies are coming true!